Welcome to the future of visual display marketing! Allowing exhibitors to enhance tone, mood or atmosphere of graphics simply with back lighting to elevate their message and brand. 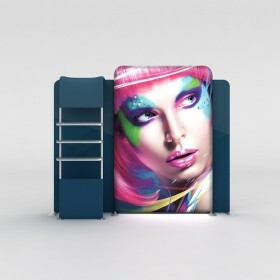 Finally stand out and get the full attention your brand or product deserves with the vibrant tension fabric graphic. The new WaveLight® display features LED backlighting and the thinnest profile of a backlit display option in the exhibit marketplace. Wrinkle-resistant tension fabric stretches over frame and zips closed. Lightweight to ship and easy to put together. Illuminate your graphic like no other with an Embrace™ Backlit Pop Up Displays. Your push-fit silicone edge tension fabric graphic will be enhanced with the bright LED light bars for the most vibrant trade show display. Easy set-up and travel. The New WaveLight® backlit displays are one of the thinnest tension fabric light boxes to hit the exhibit market. Within just a 50mm aluminum pipe profile (two inches), the WaveLight® frames an array of perfectly positioned LED lights to achieve an ultra-bright, evenly-diffused backlit display – making everything on the graphic look more brilliant and vibrant. The WaveLight® Backlit Graphic is a single-sided, wrinkle-resistant, dye-sublimation fabric print with Heise™ total blockout fabric on back. The pillow-case fabric graphic snuggly zips around the frame and lights, which provide tension for a smooth finish. A zipper on the lower back of the blockout fabric provides easy access to the lights and running power cables. The WaveLight® Backlit Display is available in 4 sizes - 3ft (36”w x 96”h), 5ft (62"w x 96"h), 7.5ft (88"w x x96”h) and 10ft (114”w x 96”h). 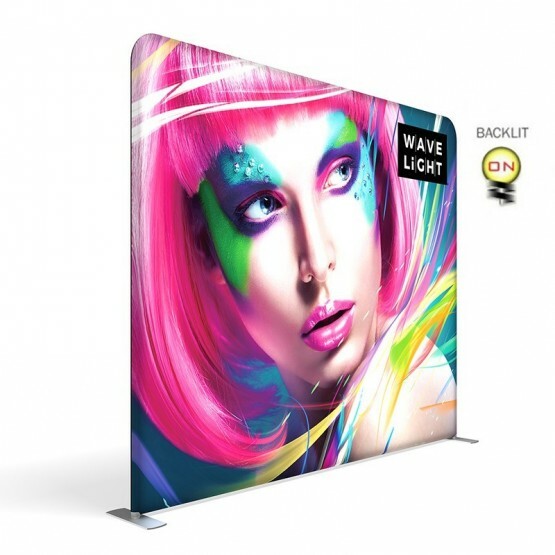 The WaveLine® tension fabric display is a great alternative to standard pop up back wall displays. Lightweight aluminum poles with bungee cord snap together to create the base framework, then slide on the pillowcase-like graphic over the frame and zip it closed at the bottom. The zipper is hidden from view and tightens up the stretched fabric graphic for a smooth image. The WaveLine® Waterfall is a great add-on shelving solution for any event and trade show displays. The display unit features 3 shelves that can support up to 9lbs each. The shelves can be placed at different heights and clamp-on the inside or outside of the frame. Enhance the WaveLine® Waterfall stand alone frame with custom zip-on fabric graphics to create a branded look. The Embrace™ full height backlit push-fit fabric display is a sleek illuminated collapsible display. 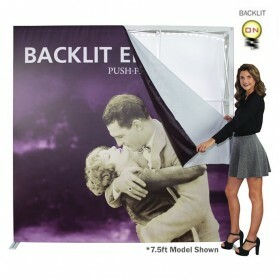 The Backlit Embrace makes it simple to make a big impact in minutes with easy-to-attach patent-pending LED lighting and a push-fit backlit graphic that attaches to channel bars around the perimeter of the frame. Simply attach lights to the collapsible frame and insert the graphic into the channel bars for an impactful illuminated display solution! Graphics available as single or double-sided with endcaps. No tools are required for assembly. A protective molded case for storage and transport are included.